This approach works well for stable climates where weather may vary significantly from year to year, but over time, the normal patterns are readily observable. The current TMY data for Burlington, Vermont (which is far in the north of the US and considered to have a cold climate) is TMY3. 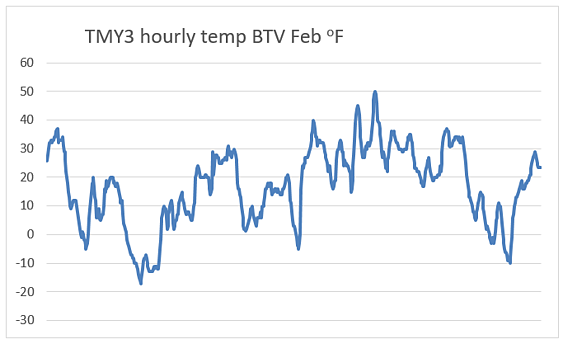 TMY3 data for Burlington, Vermont uses February 1995 to represent “typical” February weather. 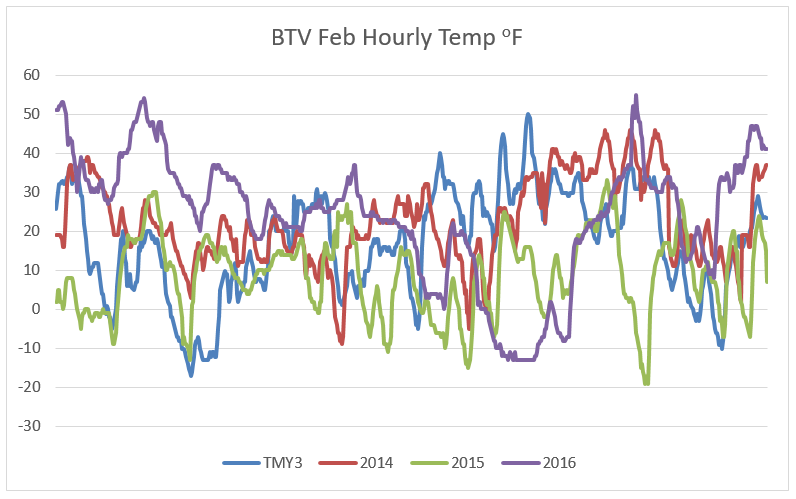 While the last three years have each been the record warmest in recorded history and the Northeastern US is warming faster than most other areas of the globe, February in Burlington Vermont, was on average, reasonably close to the TMY3 data. However, the closeness, on average is driven by 2015 being a particularly cold winter with the polar vortex affecting the weather. 2017 is shaping up to be another warm winter. While we are still close enough to use TMY3 for the month of February, the industry needs to consider whether we can continue to consider that “typical” weather occurs or if our analyses need to reflect current weather trends when estimating future savings for energy efficiency investments being made in a time of continued warming of the climate. TMY data cannot reflect the continuous and potentially accelerating warming trends that we are experiencing. We may be significantly overestimating heating savings and underestimating cooling savings over the life of measures being installed now that will persist into the middle of this century by normalizing savings to weather patterns that were occurring decades before the savings will begin to accrue. Because any attempt to use historical data as representative of future weather data seems decoupled from the reality of climate change, going forward, if we continue to normalize to try to account for weather anomalies, we should very likely use the most recent three years of data. However, we may need to develop factors that account for continued warming going forward to more accurately estimate the savings for energy efficiency measures.